Being a Steward of Financial & Environmental Sustainability is a goal within the Village Long-Range Plan and seizing opportunities to "green" its operations is a high priority. Village staff, with input from the Environmental Concerns Commission, has implemented current best practices and developed a roadmap for achieving environmental sustainability. The permeable pavers and water filtration systems used in this project will result in a 68% reduction in stormwater runoff (1,498,715 gallons per year) and reduce the amount of pollutants discharged into St Joseph's Creek. This wind and solar powered street light system in the Prentiss Creek subdivision is projected to save $107,944 in maintenance and electricity costs over 25 years and result in a 500,000 pound reduction in carbon emissions over 30 years. 83% of Village owned vehicles use alternative fuels including biodiesel, ethanol, compressed natural gas, or propane. Public Works Director Nan Newlon along with Management Intern David Rauch accepted the The Illinois Governor's Sustainability Award on behalf of the Village at a ceremony hosted by the Illinois Sustainable Technology Center (ISTC) in Peoria on October 29. The Public Works Department plays an integral role in the implementation of most green projects. Congratulations to the entire Sustainability Team at the Village for their leadership as environmental stewards. The ISTC is a unit of Prairie Research Institute at the University of Illinois. 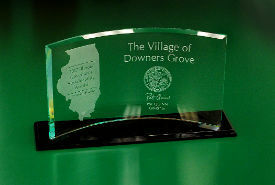 Since 1987, the ISTC has presented Governors awards to organizations in Illinois that have demonstrated a commitment to environmental excellence.